The New Orleans Saints lost in the NFL Playoffs in heart-breaking fashion for a 2nd consecutive post-season yesterday evening, but this time around it was at home due to a very questionable and controversial “no-call” by officiating that led to their eventual defeat rather than the previous year’s missed tackle on the road at Minneapolis. The Saints lost to the visiting Los Angeles Rams by a score of 26-23 in overtime, on a clutch 57-yard field goal by L.A. kicker Greg Zuerlein that sent them to Super Bowl LIII in Atlanta. But it was the way that the game ended in regulation that was a very bitter pill to swallow for Who Dat fans. Saints head coach Sean Payton in his post-game press conference, told reporters that the NFL’s head of officials told him that the referees on the field “blew the call” by failing to throw a flag against the Rams for pass interference with less than 2 minutes remaining in the 4th quarter of yesterday’s 2019 NFC Championship Game at the Mercedes Benz-Superdome. And as Payton noted: the Black and Gold will “probably never get over it” after Los Angeles would take full advantage of what can only be accurately depicted by words as an egregious error in judgment by officials in the final minutes of regulation. Rams CB Nickell Robey-Coleman appeared to be guilty of a blatant interference call with a helmet-to-helmet hit on Saints 3rd-year wide receiver Tommylee Lewis at least a split-second before the ball thrown by QB Drew Brees arrived in the vicinity inside of the Los Angeles 5-yard line. At the time, the score was tied at 20-20, and the seemingly obvious mistake by the two officials closest to the call (side judge Gary Cavaletto and down judge Patrick Turner) would subsequently force the Saints to settle for 3rd year kicker Wil Lutz’s 31-yard field goal that made the score 23-20 with 1:41 left remaining to play on the game clock in regulation time. “For a call like that not to be made, man, it’s just hard to swallow. And then to get a phone call …” Payton said to reporters via NOLA-based Associated Press NFL writer Bret Martel. The controversial decision occurred with 1:45 remaining on a 3rd-Down-and-10 play at the Los Angeles 13-yard line. Robey-Coleman appeared to make helmet-to-helmet contact against Lewis well before the ball got there, which in turn enraged Payton and the Saints coaching staff on the sidelines and caused the sell-out Superdome home crowd to erupt with a litany of “boos” when no flag was assessed as it should have been. 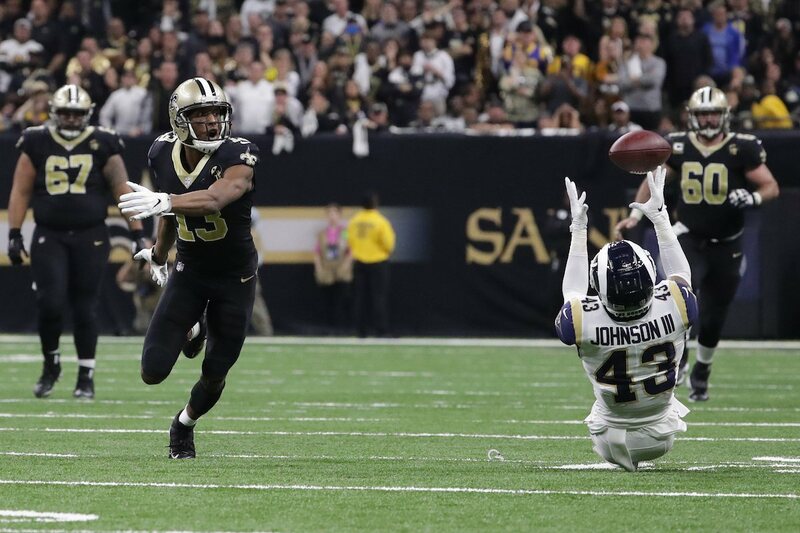 Had the blatant “no-call” been assessed, it would have given New Orleans another set of downs just inside the Rams 5-yard line and a golden opportunity to run the clock all the way down before kicking a potential game-winning kick in the last few seconds of the contest. Instead, the Black and Gold were forced to settle for Lutz’s kick; and it left Los Angeles with enough time to mount a drive of their own; which ultimately ended with Zuerlein’s game-tying 48-yard field goal to send the game into overtime at 23-23. The Saints won the coin toss and got the ball first to begin the overtime period, but on a 3rd down play on the opening drive, Brees was hit as he was attempting to pass by Rams edge rusher Dante Fowler; which would lead to a costly interception by Rams strong safety John Johnson III that he was able to make as he laid flat on his back. The Rams got the ball at their own 45-yard line, and after that drive eventually stalled at the Saints 40-yard line, the Rams sent Zeurlein into the game for a long 57-yard attempt, which he then drilled through the middle of the uprights and gave disappointed Who Dats heart-break for a 2nd straight year. After the game inside the Rams locker room, Robey-Coleman admitted to reporters that he initially believed that he would be penalized; but that an official on the field (Turner) told him that the ball was tipped, although subsequent replays from FOX clearly showed otherwise. “Obviously, it’s a disappointing way to lose a game. Frustrating,” Payton said. “And, man — there were a lot of opportunities, though — but that call puts it first-and-10, we’re on a knee three plays, and it’s a game-changing call. 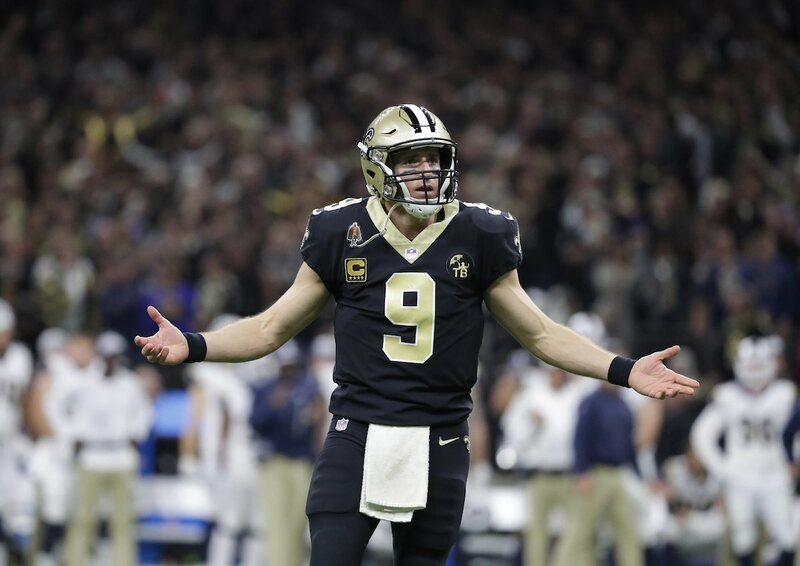 Brees — who later before leaving the stadium told assembled reporters that he does intend on returning with the Saints next year for what will be his 19th NFL season — said that the team was initially able to re-group and focus on finishing the game, but that now the franchise will instead be left to lament what “could have been”. 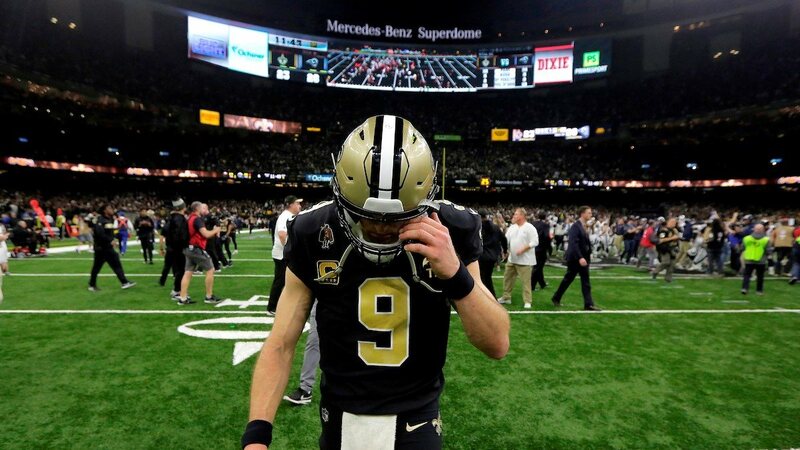 It can’t be understated just how gut-wrenching it was for devoted and loyally faithful Who Dats to experience even more heartbreak on top of the previous well-documented disappointments that have occurred throughout the franchise’s 52-year history including last year’s infamous “Minneapolis Miracle”. Two dates for Who Dats to keep in mind as they look forward to the upcoming year: the NFL Free Agency signing period will get underway at midnight on March 13th, and the 2019 NFL Draft will be held in Nashville, Tennessee on April 25th-27th. But until those dates arrive: Saints fans will be left with nothing to ponder but the bitterness of another successful season that unexpectedly has ended yet again in one of the cruelest ways possible. UPDATE: A petition has been circulated on Change.org calling on the NFL to grant the Saints a “second chance” rematch against the Rams on Saturday, January 27th. Currently, the petition has gained more than 170,000 signatures. You can sign for yourself here. Why didn’t Sean Payton throw a challenge flag for the interference? That should have been the first immediate thing he should have done. Why didn’t he do that? Because he couldn’t challenge a flG that was never thrown and a call that was never made. There was no way Payton could challenge what the ref deemed didn’t happen. In fact the ref lied. He told Coleman that the ball was tipped when clearly all footage shows otherwise.